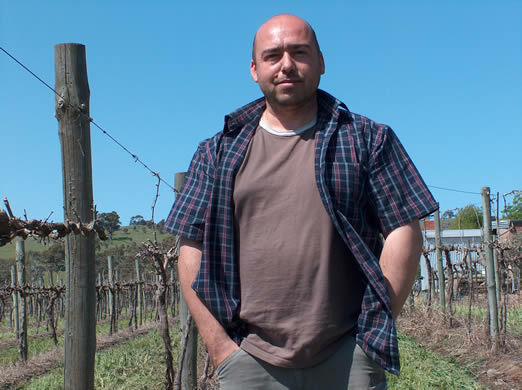 I'd visited Domenic at his beautiful property at Mount McKenzie before, when I was really impressed by his Frost Dodger reds, made from Shiraz grapes part dried on racks (see earlier report). This time round there were two new themes to explore. First, a wonderfully refined Eden Valley Riesling and a series of reds from the Adelaide Plains. I also had another look at Frost Dodger itself. 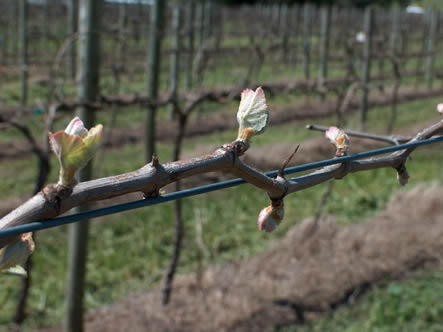 You'll recall that Domenic's vineyard is in the Eden Valley, in a frost-prone region where the risk of damage is from the beginning of October to the second week in November. 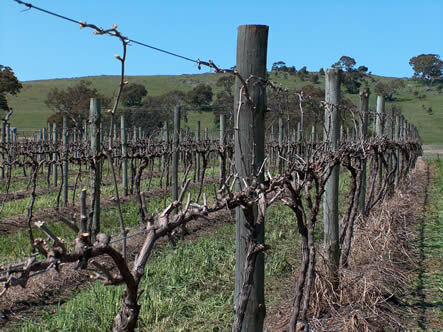 As a result, the vines are pruned with a permanent cordon (two woody arms which are then spur pruned), and an insurance cane trained onto the higher guide wire (see picture on the right). The Riesling is the latest addition to the Frost Dodger stable, and comes from 1970s plantings in Mount McKenzie, Craneford and Mengeler's Hill. In contrast to the cool-ish Eden Valley, the Adelaide Plains are the hottest viticultural region in South Australia (thermally, that is). This is where Domenic hails from, and while it used to be a popular place for growing grapes (Penfolds' Grange used to have a decent contribution from this area) it's fallen out of favour. Domenic's latest mission has been the Old Plains Wine Company, which is a joint project in collaboration with an old schoolmate, Tim Freeland. The old vineyards were non-profitable and were being pulled up by growers, who typically kept small blocks to make wine for family and friends. Since 1996, Domenic and Tim have been sourcing these remaining small blocks, perhaps of half an acre or two acres. They have also taken cuttings from old vineyards and planted 10.5 acres of their own, releasing the first wines with the 2004 vintage. I tasted a mix of 2004s and 2005s, and I think the results are fantastic. The notes speak for themselves.